Last night Matthew McConaughey won an Oscar for his role as Ron Woodroof in "Dallas Buyer's Club". He very much deserved it. Mr. McConaughey is an outstanding actor and he routinely suspends the disbelief of millions. In speaking after winning "Best Actor in a Leading Role", his own human thought-feelings were on display for the World to see - with no re-takes. 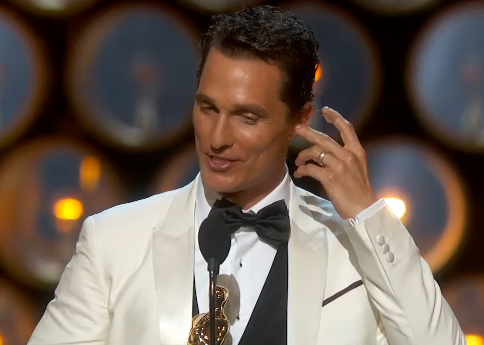 Early in his acceptance speech, McConaughey says, " ...[laughter] Thank you - Thank you, thank you, thank you, thank you - to the Academy for this - all 6000 members ...". Just as he says, "... all 6000 ...", he shows us an "Ear Screw" (image above). Additionally, this nonverbal is performed with his middle finger. This body language MAP displayed within this cluster-context (Manipulator, Adaptor, Pacifier) indicates that McConaughey was lying when he was thanking all 6000 members of the Academy of Motion Pictures Arts and Sciences (this was one group to whom he was NOT thankful - although he certainly sincerely thankful to many others) and he was simultaneously flipping some of the 6000 the bird. This nontraditional location (in his ear rather than high and in front of one's body) of an emblem (a nonverbal, the meaning of which is regionally or universally known, in this case the derogatory display of his middle finger) is known as a "Partial Emblematic Slip" (Ekman) - and it is highly consistent with deception. This is yet another example of just how subconscious body language is - and despite the fact that Matthew McConaughey gets paid to lie to us (and we reward him and others with huge income and status for being very good at it) - he is only human. And particularly when he plays himself, his nonverbals will betray him just like the rest of us.